As part of its commitment to strengthening its regional network, Hackensack University Medical Center emergency medical transportation helicopter first took to the sky on April 7, 2012. “Our medical center is constantly seeking ways to better serve the needs of our community and patients. As the Hackensack University Health Network continues to expand, this helicopter will offer vital transport services to not only Hackensack University Medical Center patients, but to our affiliate hospitals as well” said Robert C. Garrett, then President and Chief Executive Officer of Hackensack University Medical Center. As the team celebrates 4 years in the air, they’re also celebrating 1,000 completed flights. That’s 1,000 patients who needed to be moved from the scene of an injury or between facilities and whose transportation needs required a helicopter. 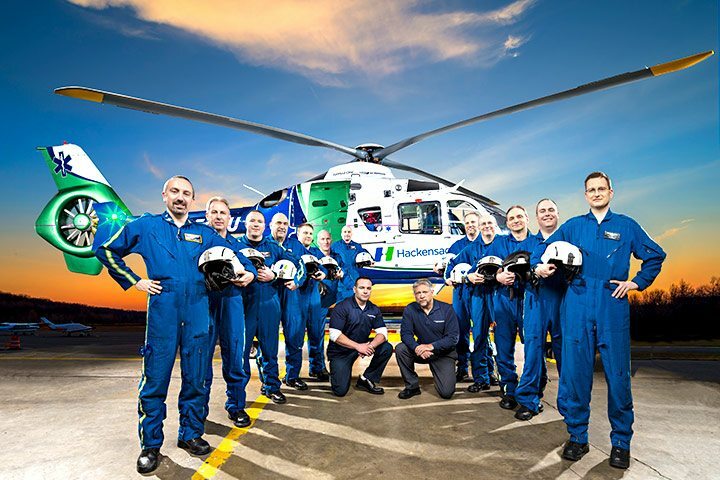 This team was recently awarded CAMTS accreditation, recognizing Hackensack University Medical Center’s air medical program for its excellence in providing helicopter EMS services. In critical situations like motor vehicle crashes, pedestrians being struck, strokes, burns, and boating or swimming accidents – where every minute and second can make a difference – our air medical team is there to care for our patients. The team consists of flight nurses, flight paramedics, pilots, and dedicated mechanics. The team is led by Chief Fight Nurse, Joe Solda and flight followed by our Mobile Intensive Care Communications (MICCOM) team, led by Communications Manager, Al McNally. Our AirMed One team partners with area police and fire departments, as wells as with the rest of our incredible emergency medical services team, to serve communities throughout New Jersey and southern New York State. Air Med One operates under FAA Part 135 Certificate held and operated by Air Methods. AirMed One provides emergent air medical lifesaving transportation of the critical and injured in our community. In addition to providing rapid scene response for trauma, stroke and cardiac events, AirMed One specializes in inter-facility transports between hospitals and expands the footprint of Hackensack University Medical Center’s capabilities and access. Equipped with a full range of technology and advanced medical equipment, AirMed One is configured to mirror that of the most sophisticated intensive care units. When minutes count on patient survival, AirMed One can make each moment count. The Patient Transfer Center increases community access to tertiary care services by streamlining the patient transfer process through a single customer service agent. Hackensack University Medical Center Patient Transfer Center services are available 24 hours a day, seven days a week, directing emergent patients into appropriate Hackensack University Medical Center tertiary care with just one phone call. Please contact Dr. Abdulla Al-Khan for consultation at CALL 551-996-2453 or CALL 551-996-2000 extension 4447.